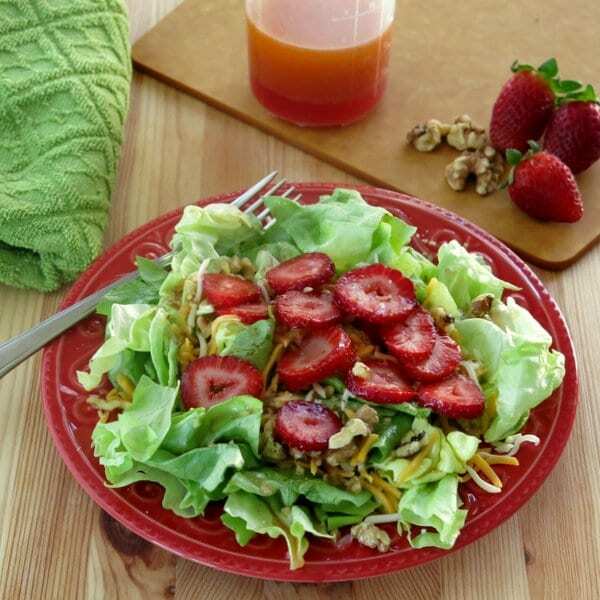 Serve this amazing Red Wine Vinaigrette Dressing with your favorite salad fixings or drizzle it over butter lettuce, toasted walnuts, shredded cheese and sliced strawberries. I’ve never met anyone that did not truly like this sweet red wine vinegar dressing! I know that’s a bold claim. But, we’ve tested it on many people. It was always offered as part of our special occasion packages at our make ahead meal kitchen. 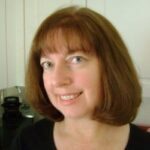 I’m sure there is someone out there who does not like it…but, I’ve never logged a complaint…only compliments! I use this red wine vinaigrette on our “house” salad. It’s so named because, if you visit our house, you’re probably going to enjoy it with one of your meals…or as your meal topped with Baked Blackened Chicken or Rock Shrimp. It’s festive, but does not require much work to prepare and it’s healthy too. Perfection! The cornerstone of this salad is the red wine vinegar dressing. Beware! Once you make your own dressing, it is very hard to alternate between store bought and homemade. You’ll be hooked on the freshness. 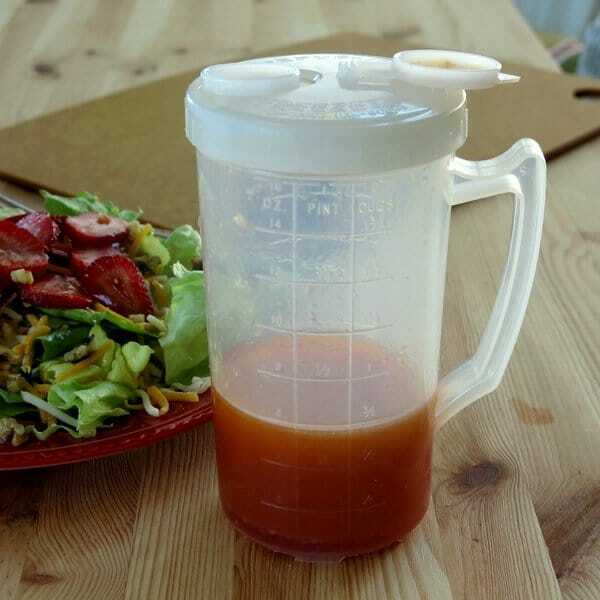 This is my favorite container for homemade salad dressing. No measuring cups required because the markings are right on the container. This sweet red wine vinegar dressing is made with canola oil, red wine vinegar, sugar, fresh garlic, salt, paprika and white pepper. Over time I’ve played with the formula. You can’t replace the canola oil with olive oil. And, it’s not the same without fresh garlic. And…it needs the sugar. Sigh. I wish I could use less or eliminate it altogether. But, ¼ cup is the perfect amount of sweetness. Occasionally I will cut it down to 3 Tablespoons. Stevia/sugar blend. I use this often. About 2 Tablespoons is the perfect amount. Check out our Amazon store for product suggestions. Splenda works great, but I try to steer clear of it. I do not like the taste of 100% Stevia. Honey results in a completely different taste. I’ve come to accept that this is one of those food items I cherish (kind of like cheesecake and dark chocolate.) I try to make the rest of the salad ingredients healthy to compensate for this indulgence. Here’s a breakdown of our house salad with sweet red wine vinaigrette dressing along with some suggestions to make it your own. Having a list of go-to, tried and true recipes is a cornerstone of meal planning! Fill a bowl with butter lettuce. Butter lettuce is tender and delicious And, I’m convinced I use less dressing when I use this type of lettuce because I can eat a plain leaf and enjoy it! Sometimes I toss in baby spinach leaves. A mix of spring lettuces is also very good. Top the salad with toasted walnuts…or pecans, or sesame seeds. Something crunchy. Toasting the walnuts adds a nice touch and only takes about 5 minutes in the oven. Mix-in shredded Monterey Jack cheese…or crumbled goat cheese or mozzarella cheese. Your favorite cheese. Add sliced strawberries…or blueberries or dried cranberries. A fruity topping. If you add a little protein you have a meal. A combination of sweet and spicy is addictive. Add some crab cakes or broiled scallops and you have a gourmet meal. Please rate this recipe if you make it and tag @DinnerMom or #DinnerMom on social media. We love to see what you are cooking up. 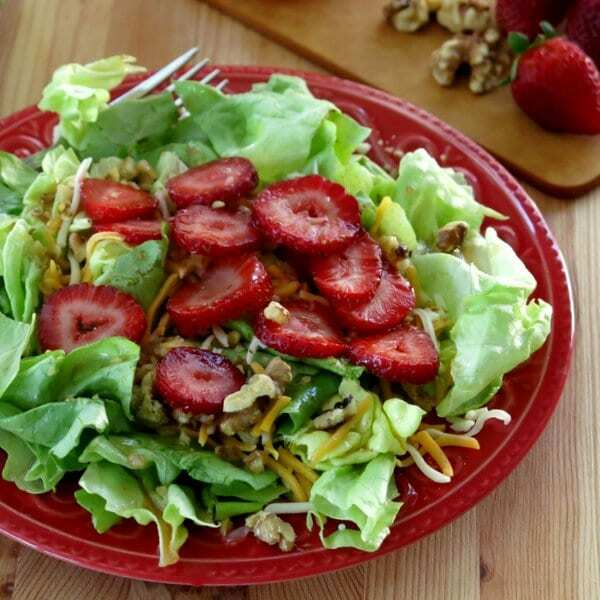 Drizzle this red wine vinaigrette dressing over salad greens topped with toasted walnuts, Monterey Jack cheese and strawberries. It’s a festive and healthy salad you’ll want to make again and again. Add all of the ingredients to jar with a tight lid and shake well to combine. Add salad greens to a large bowl. Drizzle dressing over greens and toss well. 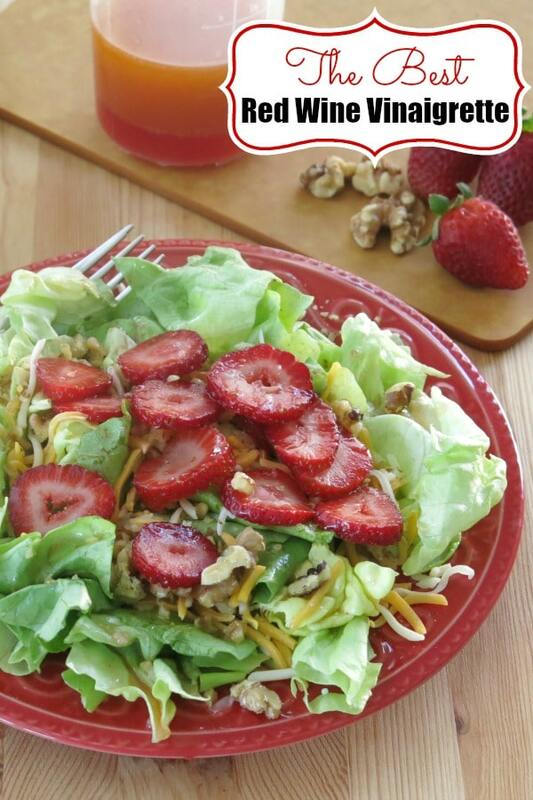 Sprinkle walnuts, cheese and strawberries over the top. Substitute nuts, cheese and fruit with your favorites. To toast walnuts, layer nuts on a baking sheet and cook for about 5 minutes in a 350 degree oven. Store salad dressing in the refrigerator for up to one week. Sounds like a delicious salad dressing…one that I should have at all times in my fridge! And your salad looks terrific as well. Happy New Year! Thanks Liz! Hope you have wonderful New Year! 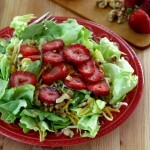 I love this – such a nice change up from balsamic with strawberries. I’m intrigued by the touch of paprika – my favorite spice! I love making my own salad dressing. Once you start you just can’t stand the store stuff anymore. I’m a big fan of red wine vinegar so I’ll have to give this a try! I even have a salad waiting for me for lunch! butter lettuce is one of my favorites, and I like berries in a salad too – all of this sounds so bright and fresh, I cannot wait to try it! thank you! I’m loving this dressing. I adore red wine vinegar! I am ALWAYS looking for a great salad dressing. This one is now at the top of my list! Sounds like a great salad, I’ll have to try the vinaigrette, I’m always looking for new ones to try! Made this salad dressing last night for a huge family dinner. Received RAVE reviews from all! It is definitely a keeper. Made my day! That’s why it is our “house” dressing! This is seriously the best (and easiest) recipe ever. It’s so delicious, I’ve probably made it at least 100x. Plus, it’s super inexpensive! I forgot to add 5 stars… but I’d give it 10, if it were an option. I’m so glad you like it and thanks for your comment! It is very truly my favorite salad dressing and I could eat it every day! LOL!!! A 1/4 a cup of sugar?!?!? That would be a lot in a store bought dressing. One reason I make my dressings at home is to avoid then being so sugar-laden and unhealthy. Totally agree! As written, the dressing yields about 3/4 cup dressing, which is 6 servings (2 Tablespoons per serving.) If regular sugar is used, then each serving will have 2 teaspoons of sugar. However, I have some suggestions to bring that down, such as using a sugar/stevia blend. And, if you are used to a less sweet dressing, then using less sugar will not be a problem and you will probably be very happy!